Our extensive coverage of the 2018 AFL Grand Final continues today as we present our props, player bets and novelty bets article! Our thoughts on pretty much everything not relating to the actual result of the match can be found below or if you want to check out our mega preview of the game with our prediction as to who will win, CLICK HERE! As usual, the Australian bookmakers have spared no expense in creating a plethora of markets ranging from player props to obscure novelties. Sportsbet will once again be initiating their BYO Grand Final bet, where you can request a market and receive odds, so we’ll run you through a few of the best BYO markets as well. The big player market is obviously the Norm Smith Medal. It is one of the most bet on markets in all of Australian sports and we are sure this year won’t be any different. Steele Sidebottom is currently the favourite for the medal after a great showing on Brownlow night but we will be looking elsewhere for value in the Norm Smith market on Saturday afternoon. If you read our game preview yesterday, then you’ll know we are extremely high on the impact that de Goey could have on Saturday. The Collingwood midfield is obviously jam packed full of stars but it’s de Goey who is the true game breaker of their side in our opinion. Dustin Martin won the award last year, but interestingly, the award hadn’t been won by a midfielder in the five years prior to that. In those five years, two small/mid-sized forwards and three defenders won the award, which differs the award from the Brownlow, which is now solely a midfielder’s award. Since Round 15, de Goey has kicked at least three goals in a game on six different occasions. He was the catalyst of the Pies getting off to such a hot start and while big Mason Cox arguably snatched best on ground honours away from him with the dominant second quarter he had, we still think de Goey was the most influential player on the ground. The Pies look for him so much every time they go forward and it seems he doesn’t shy away from the spotlight at all, probably the opposite in fact. If the Eagles come out victorious on the weekend, which we have tipped them to do so, we think it could be McGovern who ends up with the Norm Smith around his neck. Has we mentioned above, defenders have won three of the past five awards and the voting panel seems to really value the work that defending generals do. We also think that the Collingwood game plan lends itself to Jeremy McGovern having a big game. They love to kick the ball long to a contest and lock the ball in their forward line. If they get to blasé moving the ball forward, McGovern could eat them apart floating across the front of packs. He’s had a bit of a niggle coming into the game but we are sure he’ll be right to go come Saturday. We can see a Brian Lake type performance circa 2013 coming from McGovern here. Sidebottom has racked up at least 30 disposals in four of his last five games and didn’t shy away from the bright lights in the preliminary final against the Tigers. The Brownlow runner up had 41 touches at a ridiculous 85% efficiency rate and was one of the best players on the ground. Sidey has had a season to remember, racking up the second most touches in the AFL with 750 through 22 games in the regular season and clearing the 30 disposal mark in 14 of his games in 2018 to date. Find it hard to believe he is still $2.25 to rack up 30 in the big one. Josh Kennedy might be the go to guy in the West Coast forward line but Jack Darling has arguably been the more consistent player in 2018. Through 20 games so far this year he has booted 47 goals and has kicked at least two goals in 14 of those games. The last time the two teams met was three weeks ago and Darling kicked two goals in that game, he also kicked three goals from five scoring shots when the Eagles played Collingwood back in Round 17. Great value for him to slot two this weekend. The Eagles and Magpies have met twice in the 2018 season so far. In the first game the two teams combined for 169 points as the Eagles scored 102 and in the second game the Pies held West Coast to just 86 points as the teams piled on 156 combined. The line currently sits at just 162.5 points, which seems a little low considering how much the Eagles have scored in 2018. They have scored over 100 points in nine of their games in 2018 so far and are were one of the highest scoring teams throughout the regular season. Pies were no slouches on offence either, surpassing the 100-point mark ten times. Three of the last four Grand Finals hace surpassed the 162.5 mark and with no rain forecast on Saturday so we think this one goes over. Outside of the Hawks, who were able to achieve the feat in all of their three flags in a row, no team has been able to lead the game after every quarter in a Grand Final since 2007 when Geelong smashed Port Adelaide. That’s seven out of the last 10 year’s that a team has been unable to do so. Further, both of the two games between West Coast and Collingwood ended in ‘any other result’ in the wire to wire market. I can see the Pies getting off to a good start on Saturday afternoon before a lapse in pressure in the middle stages of the game allow West Coast to kick away. Back any other result here. The best Australian sportsbooks are providing a great range of AFL betting promotions for the Grand Final this weekend. Take full advantage of these promos while they are on offer!! Sportsbet have some great promotions for the upcoming 2018 AFL finals series and the Grand Final. Back a team in the head-to-head market and if your team goes on to win, you'll get double the winnings up to $50 value. 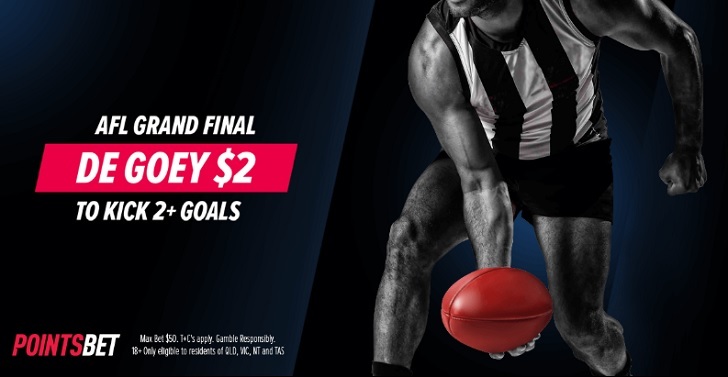 The folks at BetEasy are pumping the price of the Magpies in the AFL Grand Final to a whopping $2! Max bet $25. 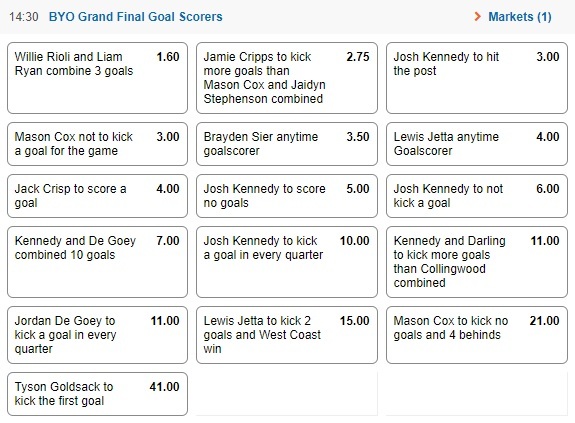 And don't forget that the AFL Grand Final Predictor is still running at BetEasy! Another $40,000 in BetEasy rewards points up for grabs this weekend! Place your AFL head-to-head bets at UBET for the Grand Final and you'll be able to take advantage of this excellent promotion. If your team leads by 15 or more but lose, get Real Money Back up to $50! Pointsbet are a great option for promotions and they are joining the party for the 2018 AFL Grand Final. Back a team to win the match in the head-to-head market and if your team loses by 9 points or less, you’ll get paid out as a winner! They also have some great boosted odds on Pies star Jordan de Goey. Get $2 odds for the small forward to kick two or more goals in the match! Neds are offering fantastic $2 lines for the 2018 AFL Grand Final all the way up until the bounce! If you fancy the Pies or the Eagles at the line make sure you head over to Neds!